Working with the National Severe Storms Laboratory and NASA I am researching severe thunderstorm interactions with that enter urban areas. Have large cities any effect on thunderstorm morphology? can they become more severe, produce larger hail, spawn tornadoes, strengthen existing tornadoes or increase straight line winds? My job entails looking at a ten year data set for numerous cities to determine if there are any trends with respect to storms life cycles. Meteorology is all mathematics and physics based, from large scale hemispheric waves to vorticity in tornadoes. Much of the modelling I do is based on mathematical algorithms, the severity of a storm can be captured by the up draft velocity (lift) and shear parameters (spin) as well as many other components. We gather this information by first looking at radar images of reflectivity and velocity. Dual Polarized radar uses mathematics to derive the power return of a radar signal. A pulse signal is sent out from the radar, when it hits an object such as a rain drop some signal is sent back to the radar, the length of time it takes to return determines the distance the drop is from the radar, the amount of signal that is sent back determines the density of the object. Hail and large rain drops show up as stronger “echoes” than drizzle. To determine the orientation of a rain drop both a horizontal and vertical beam are sent out (dual) so a big flat raindrop doesn’t get mistake for a hailstone or snow in the winter. We use radar information to determine if a storm is producing hail and is do what size hail, we can also determine the wind velocity and from this determine if there is rotation in the storm or violent rotation in a smaller area may represent a tornadic circulation. We are looking to see if these parameters increase over heat islands produced by large cities. Basic Trigonometry and Algebra are the building blocks, Calculus, Differential and Partial Differential equations bring it all to life. I actually have a very different path to most. After school I went to study Production Management at the University of Limerick. I had struggled with maths during leaving cert and dropped to ordinary level, however I got an A but I was told there was no hope for me studying Meteorology. Productions management however had a lot more maths than I bargained for and with a lack of confidence I struggled. I managed to scrape through and got a Bachelor of Technology in Production Management in December 2004. In 2005/2006 I returned to college to study acting. I found I was way too nervous giving presentations and standing in front of people that I needed to force my self on to the stage to learn to act and find my confidence. I got a FAS certificate in 2006. In 2009 after some health issued and a new view on life I decided it was time to listen to my heart, forget the advise I was given by my career guidance teacher and study Meteorology: something I had dreamed about since I was 4. 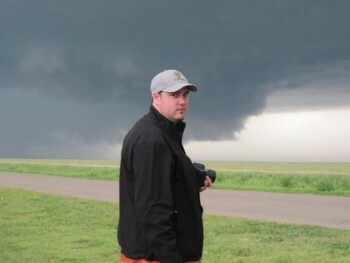 I had a passion for severe weather and had been storm chasing in the US a few times, I had soaked up enough knowledge that my mind demanded more. America, the home of weather research beckoned me, I spent 2 years in Chicago at a community college, The College of Dupage, a renowned small weather program full of passionate people trying to follow their dreams. I struggled to get back into Calculus to start, it had been so long but I was determined, I made my way through 2 seconds of Calculus there as well as taking a few meteorology and basic physics and chemistry courses. Now with some momentum and confidence behind me applied for a number of Universities, the number one choice was the University of Oklahoma, arguably the home of severe weather/tornado research. The University was also home of the US National Weather Center, The National Severe Storms Laboratory and many more research groups, the ‘fathers’ of many modern day Meteorological theories used today, are professors or advisors at the university. As fate would have it I got into that university and I spent three years there studying around the clock, struggling to find my grove. By the end of the three years and in a much smaller class than I started with, I finished going strong, all A’s in my last semester proved anyone can triumph over adversity if they are passionate enough to do so. I graduated with a Bachelor of a Science in Meteorology in May of 2014. If you are passionate about it follow that passion, don’t just be a dreamer be the one that makes your dream a reality. It takes passion and a lot of hard work but it is a relatively young science with plenty of scope. I may be biased but it by far the most interesting science and with global climate change and green energy projects growing rapidly the need for meteorologists in research, forecasting or the private sector is sure to expand in the coming years. There is so much that interests me, understanding the life cycle of storms how the evolve, how they grown, what environment help or hinder their growth, what environments enhance rotation in storms and aids tornado genesis, the effect of friction or near surface wind flow patterns. There is so many interesting aspects of this job, getting to go out and observe storms in the field is the added bonus. The challenges often involve conceptualizing the mathematics, especially when discussing the likes of radar meteorology or cloud physics, I am a visual person I like to imagine the mathematics at work, with a tornado that is pretty easy, I can stand in a field and watch the mathematics at work, in cloud physics I need a little more imagination and a clear understanding of how every equation interacts.